I first encountered the notion of a social entrepreneur after attending an event hosted by Lord Wei at university and since have looked on social entrepreneurs and social entrepreneurship as a target to aim for: a somewhat angelic and noble mantle to take on. In a way, they’ve been my role models ever since. More recently (with the arrival of Stemettes) I’ve been lucky enough to be able to call myself a social entrepreneur and with that status I’ve very quickly discovered the ‘behind the scenes’ of being a social entrepreneur. Back at university, I had initially seen one problem that social entrepreneurs might have: being able to make enough money to cover the bills. On the outside, looking in that seemed to be the only problem – if you’re doing good and saving the world, who is going to pay you enough to do that? 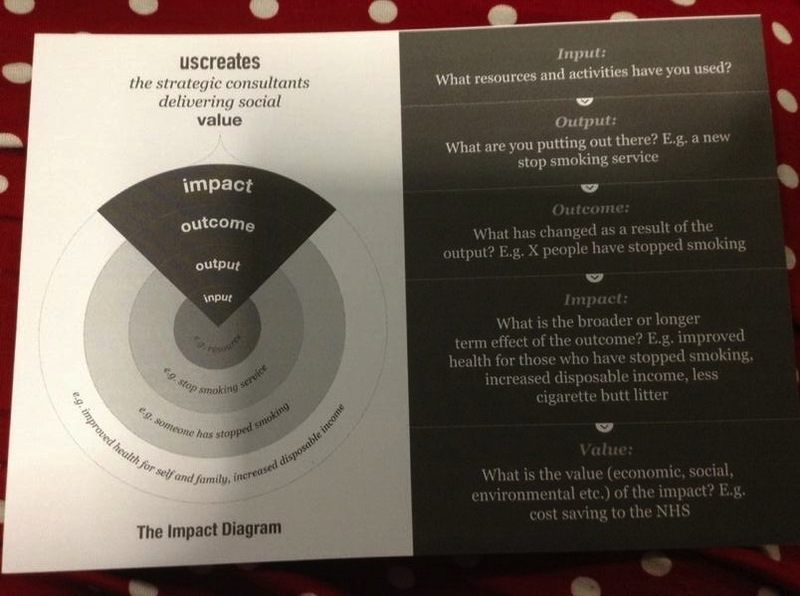 Nearly 9 months in, I can now add a second, possibly bigger problem: measuring social impact. These last couple of months, this problem has increasingly been keeping me awake at night. After attending a brilliantly insightful event run by uscreates at Hub Westminster (check out the #goodwedo livetweets) – where a panel of social impact measuring people in turn shared their perspective on social impact measurement – and didn’t have much extra left to divulge during the Q&A session – I wonder how any social entrepreneur sleeps. As they spoke I noted down a lot of things. Here are the highlights. Prioritisation – if you’re doing good work, then that takes priority over spending time measuring and analysing it. Often, if you’re stretched doing your social enterprise’s main activities, then social impact measurement slides down your to-do list. Accountability – the feedback loop on social activities isn’t as clear as a commercial feedback loop. If a company starts to sell things the customer doesn’t want, then customers vote with their feet and sales drop. For social enterprises you need to be clear on who your ‘customer’ (or beneficiary) is and be clear on what the feedback loop looks like. It’s not a simple as ‘less sales’. Proof – how do you prove the impact you’ve managed to measure? Quantitative data is difficult to get and often misses out on the nuances and insights gained from more qualitative and anecdotal info. Often quantitative data has to play second fiddle and simply back up the qualitative data you have. Improve – it’s difficult to improve if you don’t know where you’re at now. Especially if the great stuff happening isn’t being measured or captured by the carefully architected surveys you use. Attribution – how do you know that the impact measured is as a direct result of the work you’ve done? Did they get their biggest break from something someone else said? Deadweight – what would have happened anyway? Would those girls have found STEM anyway? Would your beneficiaries have figured it out on their own? Dropoff – how do you deal with those who don’t finish your programme? How do you measure that impact? Displacement – how do you know your efforts and good impact hasn’t replaced jobs and impact of others? Did sending constantly sending your volunteers to that care home mean that a carer lost their job? Externality – what benefits have come from external forces which were not in your control? Another panellist posts impact reports every 6 months to their beneficiaries (young people) and their team. Stakeholders aren’t the main audience for their reporting. They’ll be launching a social media campaign around their next report. They’ve also been able to embed measurement in all of their activities across the various things they do. The next panellist is trying to create a ‘Bloomberg’ for social impact data and bemoaned the lack of data, and lack of quality of social impact data. He suggested that ratios might help for comparability. Looking at my own iterative attempts to measure impact on Stemettes the uscreates event helped me feel good, but not complacent. We’ve gone from doing a simple headcount at events to conducting a 12 question survey before and after every event. We’re also capturing stories in a slightly better way than we did when we started. Girls are making social connections and reusing the skills they’ve learnt, and we’re aware of it. Our continued social impact measurement efforts and reinforcement at the event bring me back to that initial ‘outside looking in’ issue. To have the manpower to collate social impact AND continue to deliver that impact, we’ll need to start making enough money to pay bills and manpower. The applications for funding we’ll need to cover that requires detailed social impact evidence and solid social impact numbers. To gather those requires manpower. It’s not quite impossible (nothing ever was in the ‘Mission Impossible’ films) but it’s a hard slog and will require a lot of volunteer’s time and my time. The word ‘social’ has many meanings and it’s become obvious to me that this impact measurement problem also exists in a certain part of the ‘social business’ world too. Enterprise Collaboration – the use of social platforms inside a company (as opposed to using social platforms for marketing purposes) currently suffers the same fate. Pinning down the value of social business, quantifying it and successfully communicating is something that I’ve been involved with trying to do for a couple of years now. Here’s hoping in looking for solutions to the social enterprise side of this conundrum, I’ll unearth the solution for ‘social business’ too. Another fascinating blog- anyone who hasn’t heard of Stemettes really ought to check them out! Measuring is like accounting: after the event. Definitions come first. Like intentions!